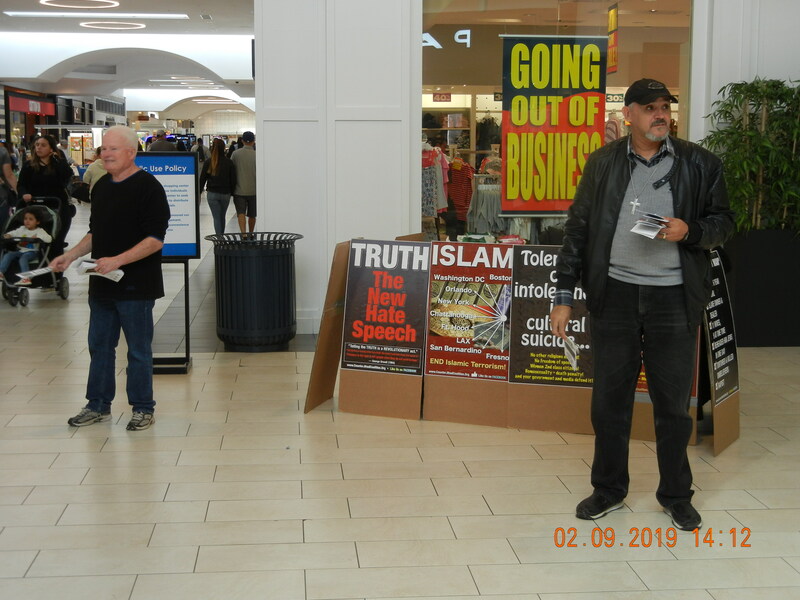 We had a great public outreach today including not a single push back by Moslems. By the end of our outreach we had passes out over 1100 brochures. 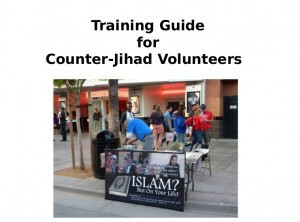 Thanks go out to Jim, Pastor J and Maria for coming out today to educate people on Islam. Once again when there is the presence of law enforcement the Moslems go running into their holes. Thanks for the LA Sheriff having a deputy posted by us and 2-4 mall security guards the entire time. 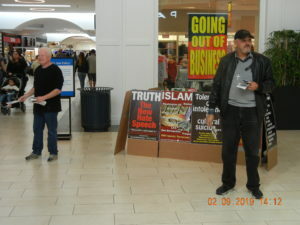 Several people thanked us for what we were doing in getting the truth out on Islam. One Chaplain stopped with his wife and asked us several questions. He was very knowledgeable on Islam and asked if he could pray over us, which he did. People stopped to ask us what they could do to educate people and stop the creeping Sharia. Many ended up taking several brochures to educate their friends and neighbors. This is the first time in the years we have been doing this that we did not get a single objection from a Moslem. I really think the presence of LA Sheriff Deputies standing close by helps keep the peace. Thanks again to Pastor J, Maria and Jim for coming on out today. Thanks so much for all you and the gang out there are doing Steve. I’m really proud of you guiys for getting out the word on Islam. Keep up the great work. Right now I’m in the Philippines kbut enjoy gettting all your many emails. They keep me informed about what’s going on in the fight for our lives! There are not many Muslims where I am, but as you probably know there is a problem with Islam on the Island of Mindinao. Good luck and God’s Speed. Thanks Rhett for the kind words.